Amanda's time in Berlin as a teenager brought a love of German food, especially currywurst (which is essentially a chopped bratwurst smothered in curry ketchup, often with a small roll to soak up the extra sauce). 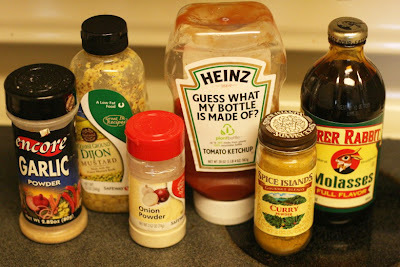 I often make it for us at home with whatever sausage I have on hand and some imported German curry ketchup. 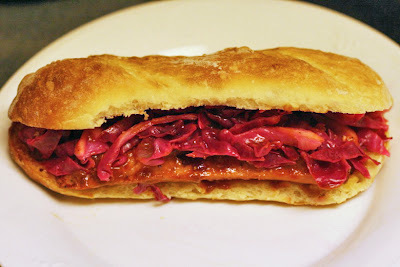 But since that's not much of a "recipe," per se, I did a mashup of German currywurst and American hotdog to create these hoagies, adding fresh pink sauerkraut right on top of the currywurst and transforming the roll into a bun. I really like the combo of flavors in this. 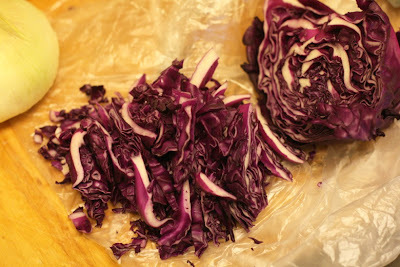 1) Chop cabbage and onion into strips no longer than three inches. 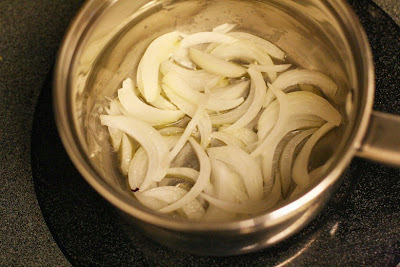 2) Add olive oil and onion to a small saucepan, and simmer on medium heat until slightly translucent. 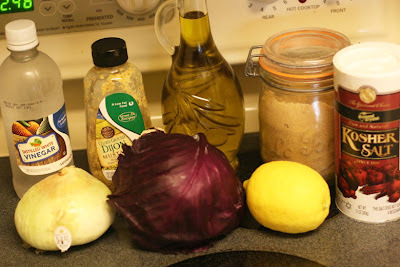 3) Turn the heat to high, add the cabbage and the rest of the sauerkraut ingredients, cover and boil for ten minutes, stirring two or three times to make sure it stays well mixed. 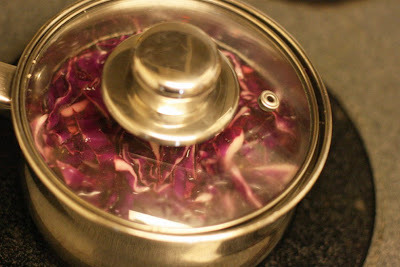 4) Drain the sauerkraut and set aside to cool slightly. 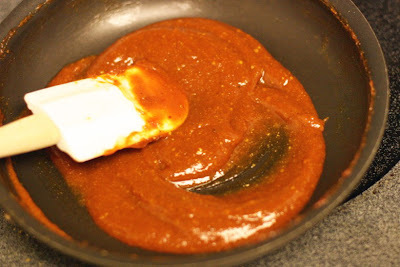 5) While the sauerkraut is cooking, you can mix together all of your curry ketchup ingredients over medium heat, stirring occasionally until completely smooth, then remove from heat to cool. 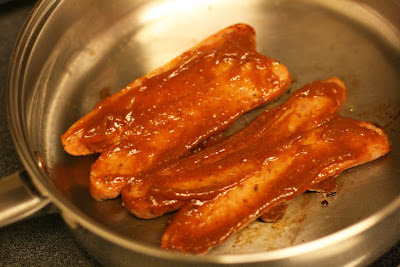 6) Split your sausages nearly in half lengthwise, and cook on both sides over medium-high heat, adding some of the curry ketchup to both sides as you turn them. 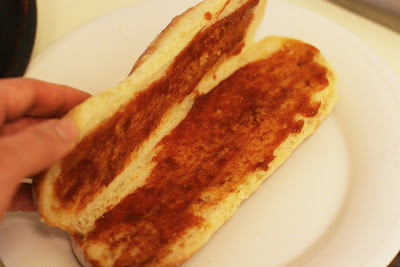 7) Toast the hoagie rolls and add more curry ketchup to top and bottom of bun. 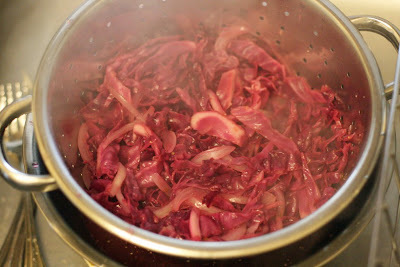 8) Add your currywurst, top with sauerkraut, and enjoy immediately.